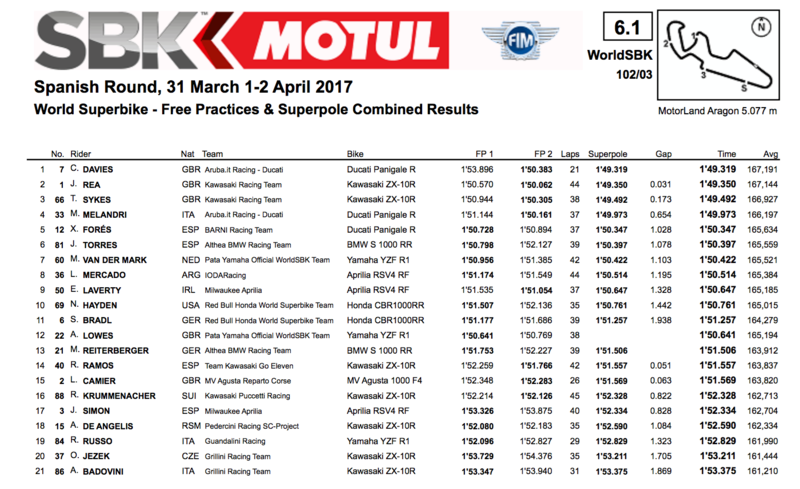 Chaz Davies (Aruba.it Racing - Ducati) broke the Superpole streak of Jonathan Rea (Kawasaki Racing Team) with a new track best of 1’49.319, using the all-new multi-lap Pirelli rear qualifying tyre for the first time. Rea also broke the previous track best, and was in provisional pole, until Davies took his fourth career Superpole win. Tom Sykes (Kawasaki Racing Team) earned a front row start in third place, 0.173 behind Davies, with the top three well ahead of the rest. 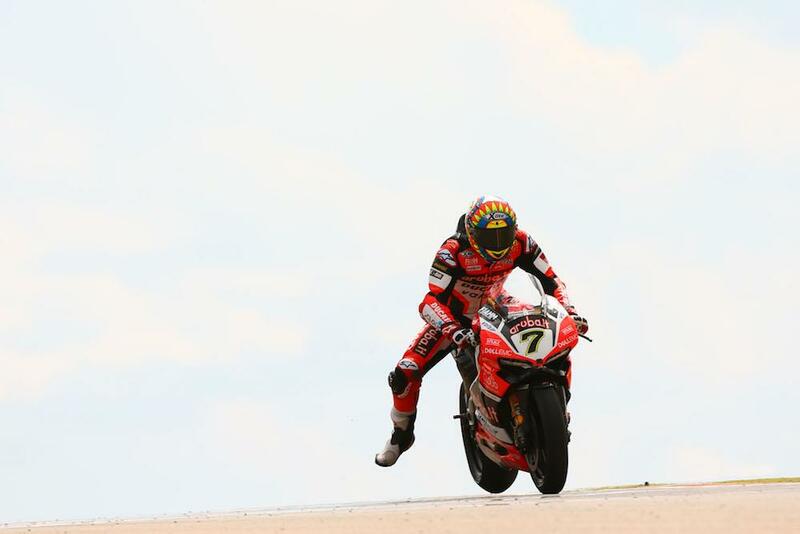 Marco Melandri (Aruba.it Racing - Ducati) placed fourth, and Ducati privateer Xavi Fores (Barni Racing Ducati) was fifth. A top day for Spanish riders saw Jordi Torres (Althea BMW Racing Team) sixth. Michael van der Mark (Pata Yamaha Official WorldSBK Team) secured seventh place, but his team-mate Alex Lowes (Pata Yamaha Official WorldSBK Team) suffered a technical issue in Superpole 2, after a heavy crash on the FP3 session. He qualified 12th, without setting a time. The oil flags came out on the back straight at one stage and there was also a technical issue for Stefan Bradl (Red Bull Honda World Superbike Team) with a small fire visible in his bike’s belly-pan. He finished Superpole 11th. Leandro Mercado (IodaRacing Team Aprilia) was eighth, Eugene Laverty (Milwaukee Aprilia) ninth and Nicky Hayden (Red Bull Honda World Superbike Team) tenth.